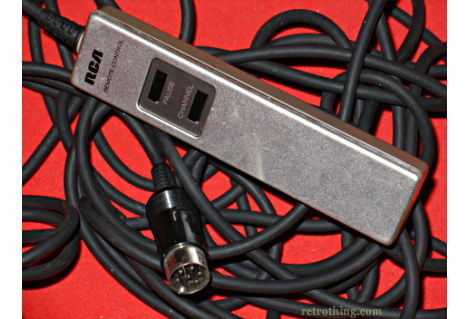 Retro Thing: Too Many Buttons On Your Remote? Okay, I'm a doofus. I've never been able to get a universal remote to work for me. I've tried a hundred dollar jobber with a reconfigurable LCD screen, I've tried one from the dollar store - no dice. I can maybe get one function to work, so a universal remote is just not going to fit into my universe. Therefore, like a lot of people I have a coffee table littered with remotes. As if multitudes of remotes weren't enough of a problem, almost all of them have nightmarish design. In some cases I've never seen anything designed to fit in a human hand that could be less accommodating to the human hand. Let's not even talk about those remotes you practically have to hold right up to the device you're controlling. - befuddled customer: "I pressed the thing and all it does is change channels." - warmly smug tech guy: "Hmm... have you tried the other button?" 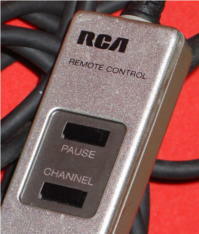 I'm oversimplifying, though the VCR I had up until the early 90's was a top-loader with a corded remote. I was spoiled with forward and reverse scan on mine as well as a noise-filled pause... so there. Actually what I'd like to come back is something I remember seeing done in the 90's. As TV remotes got more sophisticated, the seldom used buttons were hidden away under a cover. Some companies went as far as to provide a pair of remotes (that's TWO remotes for you to lose in the couch! ), a much simplified day-to-day unit, and a Sunday-go-to-meetings fancy pants one. I hope that someone comes along someday to solve this multi-remote problem for me. Then again, walking the six feet to the television set every day just to control it may be the only exercise I get.